On Sunday, our clocks moved forward. Or was it backwards…ummm…this always causes great debate…hang on…”Spring=forward, Fall=back”. Ahem. The Homestead resonated to the sound of the tsunami sirens as they are put through their bi-annual paces. For the record, they came in loud and clear, perfectly audible over the general noise of the Homestead in action at 11am on Sunday morning. Personally, we’d be happier with no chance of a tsunami, but we acknowledge we were the ones that chose to live one block from the beach. BBQ time is here again and that means the garden suddenly turns into one giant salad. Now, we know that lots of people love their greens unadulterated, or with a squirt of lemon and a dusting of black pepper, or perhaps a drizzle of olive oil. We are not among that throng. The fact that we require our salads to be dressed was the cause of not a little consternation when we started taking this way of life seriously. You see, supermarkets the world over (those we’ve seen anyway) dedicate shelves upon shelves of space to an unending plethora of salad sauces and most of them are utterly delicious. We love vinaigrette, mayonnaise, creams, dressings, and oils. In the old days, our fridge door groaned under the weight of, at the very least, four at any given time; four choices of rich salad-augmenting scrumptiousness, four stunningly different flavours depending on your mood. Garlic and Avocado? French? Coriander and Balsamic? Good old fashioned mayo? Four stubby little plastic bottles with cunning little flip-up plastic tops and all hygienically wrapped and sealed – with plastic. In our clean, green, tread-lightly-on-our-planet ethos, dressings just weren’t going to make the cut, no matter how much we worked to justify them. We went for one whole salad season using only homemade oils and vinaigrettes. There is a Provencal/Spanish/Italian saying (someone must have said it because every book or website we researched in our salad dressing deprived delirium said so) that it takes four men to dress a salad: A miser for the vinegar, a wise man for the salt, a spendthrift for the oil and a crazy man to mix it. Overlooking the whole “man” thing, we spent a while adhering to the general rule of three tablespoons of oil to 1 tablespoon of acid (vinegar/lemon juice), a pinchette of salt, and the merest hint of ground pepper, frenetically shaken into submission in an old jam jar . We found it to be…pleasant; satisfactory. Okay. 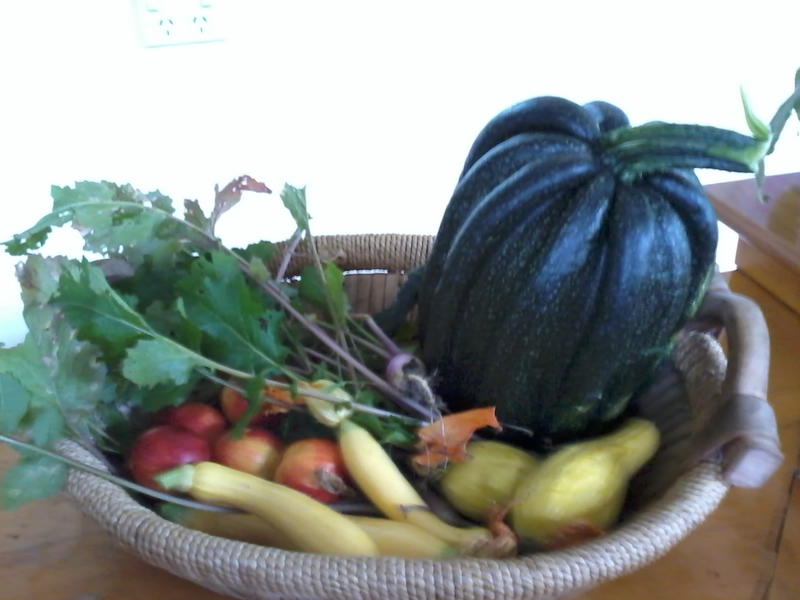 Forgive us, but we felt the vege we spent hours sowing, weeding, mulching, feeding and watering deserved a bit more pizzazz. We weren’t going to tolerate tolerable. So we started tinkering. We like a bit more acid in our dressings and by far the best acid we’ve found to add is the brine we use to pickle our cucumbers and gherkins (after we’ve fished the aforementioned cucurbits out of it, we mean). We put in a slug of good olive oil, add about half that amount in brine, half a teaspoon of home made mustard, maybe a crushed garlic clove or some finely diced chilli, into a screw-top jar (we don’t add herbs to our dressings, preferring them directly in the salad bowl) and shake the lot until it’s emulsified (it looks cloudy and opaque). Employing Farm Girl’s impeccable tastebuds, we add salt and/or pepper on her recommendation, and attempt to stop her guzzling the lost before it hits the salad. 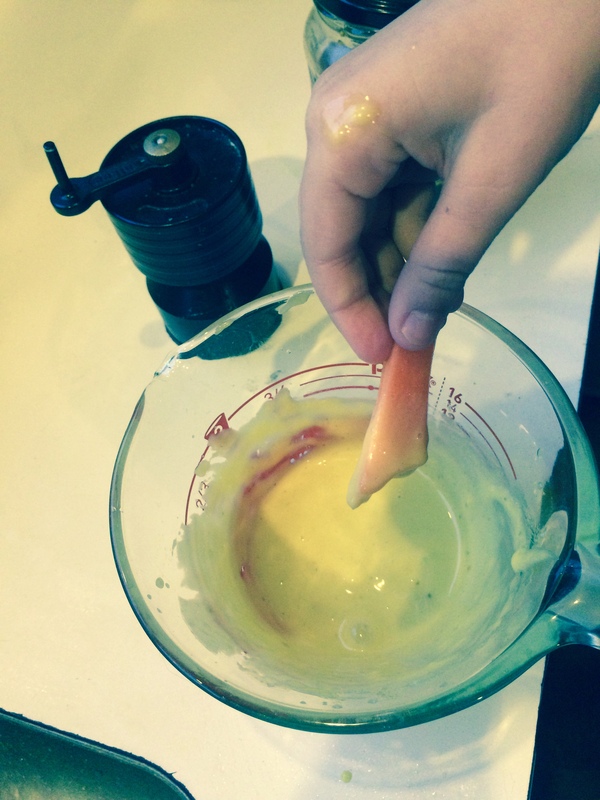 This dressing is great for coleslaw, which we eat in huge amounts, and other hearty salads; Farm Girl likes it on her lunchbox carrot sticks (at school she’s on her best behaviour and only drinks the dregs when the teacher’s not looking, apparently). Any attempt of ours to make a creamy dressing was a total disaster with the exception of the condensed milk concoction of The Milk Maid and Bean Counters youth, and that only served to show how much tastes can change in a couple of…decades. Then one day we discovered aioli and it was like the sun came out from behind a cloud. This recipe is made with raw egg yolks – use eggs you utterly trust! We’re not quite sure how it worked, or why it worked; we’re simply happy that it did. We use it stirred through steamed broccoli or beans, mashed into spuds, to decadently dredge our treat hot chips through, as a cruditè dip and, of course, ladled greedily over our salads. The perfect texture is gloopy and butter-like, but sometimes things just go a bit bad and you achieve something less than this. We’ve never had the mixture split, but sometimes it’s runnier than we’d like. Apparently you can add another egg yolk, but we don’t bother…it still tastes gorgeous. 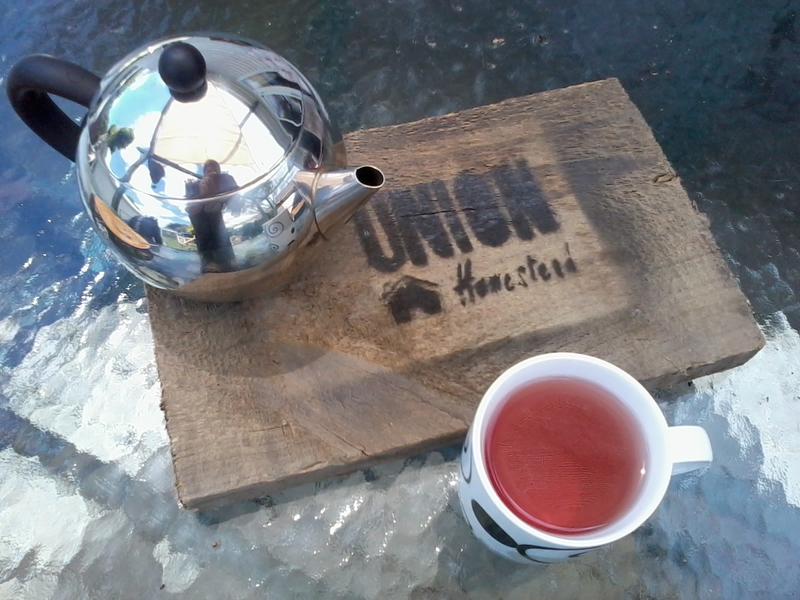 This entry was posted in Union Homestead and tagged aioli, baking, basic, basics, breakfast, cooking, cooking with eggs, delicious, dinner, dressing, dressing recipe, eating, egg, eggs, Food, foodie, foodies, garlic, good eats, lunch, mayonnaise, meal, olive oil, recipe, recipies, salad, salad dressing, salad oil, simple living, simple recipes. Bookmark the permalink. Interesting to hear about the tsunami siren. I hope you never hear it for real. 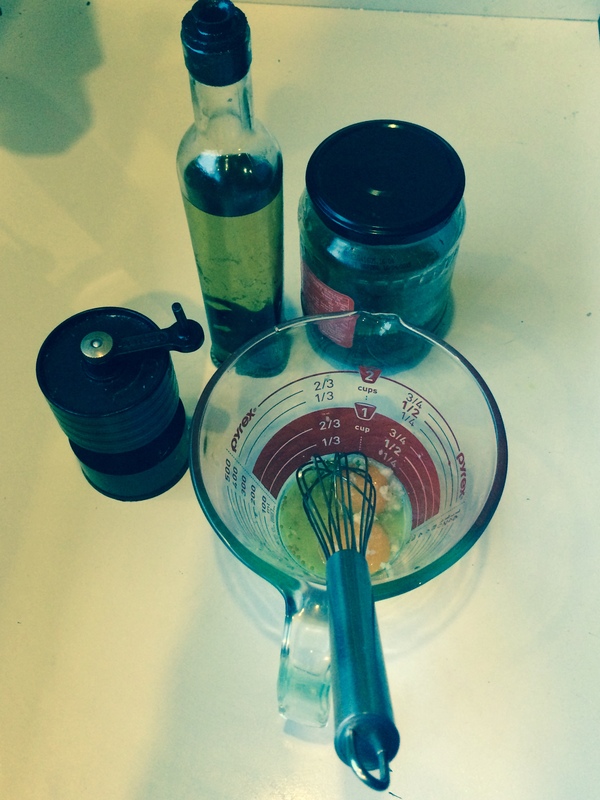 Thanks for the aioli recipe – have just run out of mayonnaise so will give this a whirl. Agreed, salad is more interesting with a dressing. Us too, re: the siren. It’s like we have a reality check twice a year, a reminder that nobody beats mother nature. 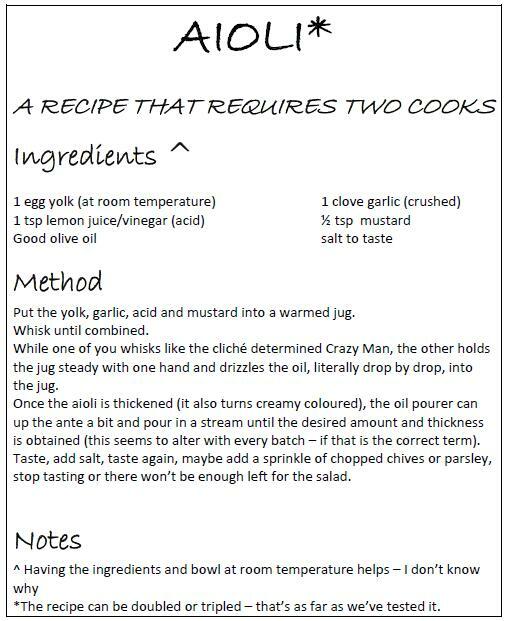 Hope the recipe works for you. We were pretty pleased when we stumbled upon it. Thanks – will try it out soon. Your final recipe sounds so delicious that it made my mouth water. I will certainly try it. Thank you! Hope you enjoy it as much as we do. Half of the fun is in being able to make something that had defeated us for so long. Crikey, must be quite something to hear the tsunami siren ! We turn our clocks back for winter on the 27th, so lucky you to be going onto summer. In all honesty, the siren is not earth shatteringly loud here at the Homestead, but certainly noticeable. Some towns hereabouts (not mine, which should, but doesn’t) have tsunami routes marked – so that anyone can see which way to get to higher ground quickly. I don’t know if they have sirens – Victoria (our local city), certainly doesn’t. Salad dressing – we left bottled dressing behind after a trip to Europe a few years ago – the bottle of balsamic vinegar and very good olive oil on the table was just so simple and delicious. 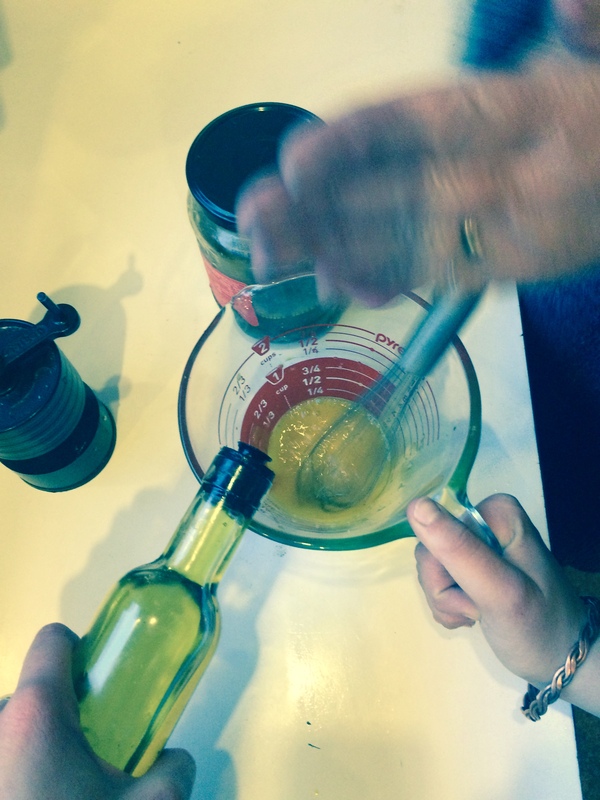 We found when we got home that the quality of the vinegar and olive oil matter a lot. A lot. We get tired of vinaigrette sometimes. I make creamier dressings with yogurt. There’s a Jamie Oliver recipe somewhere for a creamy Caesar dressing (I think it’s in Save with Jamie) that is yogurt and avocado with other stuff. Very nice. I just did in the last of the laying flock yesterday, so won’t be trying your aioli just yet (I’m not buying eggs for a raw egg recipe! ), but it looks fairly simple. Love the idea of using the juice from the pickle jar. Definitely giving that a go. Very sensible marking the tsunami routes- this has always been our issue with the whole deal. New Brighton has only three major routes out – two over bridges. We saw, in both the September and February quakes, the road outside our house become instantly (and I am not exaggerating) gridlocked. Our best bet here is getting on our bikes and pedalling for the hills. In all honesty, our biggest threat is from the North Island which would shake us up too and in which we’d get very little reaction time, or South America in which we’d get 15 or so hours notice…neither really needing sirens as far as we can see but it puts people’s minds at rest I guess. I totally agree re the quality of oil and vinegar and it’s funny you mention our friend Jamie – Farm Girl has just discovered his DVDs in the library and is totally smitten with both him and his cooking style (which fits in very nicely here). Mr Oliver has dictated this weeks menu and the cook has been ably (and in a very beady eyed manner I might add) assisted by FG standing on the flour barrel. We did have but one small outbreak of tears which was totally my fault I admit. Mindful of the dishes it incurrs, I chose to hand mix something by hand rather than “wazz it up”. Oh dear! I enjoy the six month lag parallels in our days. Ha..the dishes, yes, Jamie clearly has invisible elves who do all the dishes he squanders. I gave my eldest daughter (19) a wand blender for her birthday a few months ago – ostensibly for her to make smoothies, since I was tired of waking up to the not very quiet whirr of the blender, and the subsequent sticky large object in the sink – BUT – that wand (immersion blender) is a thing of beauty for stirring round in a pot of soup to thicken it up. And it rinses clean under the tap. My kind of gadget. It was Jamie’s Kitchen series that turned my hubby onto cooking from scratch, and visiting restaurants that do the same. My daughter and I watched Food Revolution which was a reality thing he did in the US, which was a bit of preaching to the choir (eg,we have never owned a deep fryer – I don’t know how to use one), and gave her a lot of spare time in a foods course in high school, as they showed it as part of the curriculum (!). You’ve lost me on the salad dressing. A little Heinz salad dressing is what I was brought up on and it is what I still like. Never realized there is such thing as a tsunami-siren…but it sounds so logical and reassuring now. Last year, it was our first time the tornado sirens went of for a reason…Mr. Walker was just on his way out for take out. Well, we post poned that meal and enjoyed it even more later when all was over and everything was still where it should be! And thank you for that delicious recipe!! Have a lovely weekend y’all!